Over at Danger Room, Noah Shachtman had a post recently poking fun of protester James Richard Sauder, who was recently arrested after scaling a fence at a nuclear missile silo. 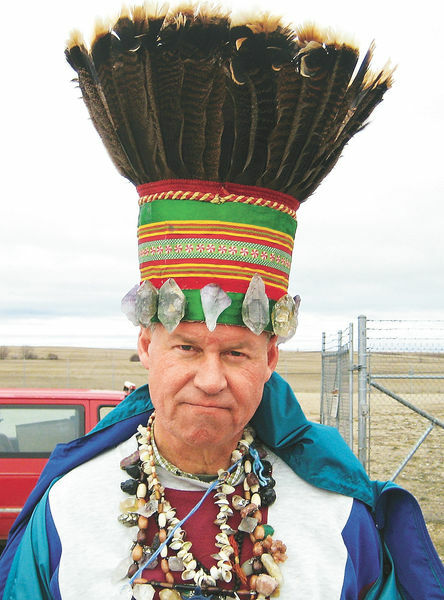 While Sauder was apparently well intentioned, his outfit and the complicated explanation of his elaborate headdress, obviously make it very easy to dismiss him. Honestly, it’s hard for me to imagine who would take someone dressed that way seriously. What really surprised me, however, was when Shachtman wrote that Sauder’s “loony symbolic protest,” paled in comparison to how crazy some of our plowshares friends are, who dressed in clown suits a few years back and broke into a nuclear base. While I was at first disappointed to read this, maybe he has a point. Shachtman from my experience is a pretty reasonable guy. The fact that he saw the clown suits as even more “loony” than Sauder’s outfit isn’t good. Perhaps dressing as clowns isn’t the best way for plowshares activists to highlight the absurdity of war and the ease with which people can get into a nuclear facility. Figuring out which symbols everyday folks will connect to is no easy task. As we’ve written about here before, how demonstrators present themselves matters and will seriously influence the likelihood that passers-by will be moved by a protest. By dressing normally or even in our Sunday best, and keeping our message focused and simple, I think we will have a much greater chance of reaching those who think differently. I agree it’s important to figure out how to appeal to your audience but I worry that will just become about mainstreaming rather than actual tolerance and change…. I would caution against judging what is respectable. Think about Gandhi’s homespun. He wore it, even in formal settings, with purpose and dignity.